For guaranteed Mother's Day delivery, all orders must be placed by 12 noon, Friday, May 3, 2019. Overnight delivery is available, please call (800) 863-7999, ext. 480 for details. Need help? Call Zehnder's Mail Order Department at (800) 863-7999, ext. 480. Zehnder's Online Marketplace offers shipping via UPS Ground. For UPS 2nd Day Air delivery or other shipping options, please contact our Mail Order Department at (800) 863-7999, ext. 480. 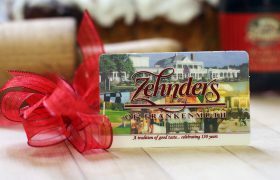 Zehnder's Online Marketplace offers several gift options. Not finding what you're looking for? Call us and we will be happy to customize a box to fit your needs - (800) 863-7999, ext. 480. The Newest Frankenmuth PANDORA Charm is Available!